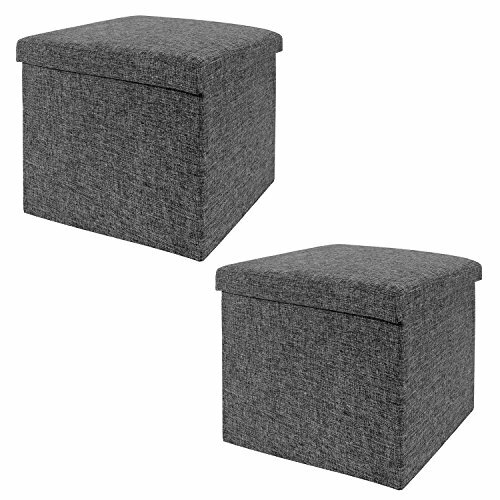 Enjoy stylish and functional furniture with Seville Classics’ Foldable Storage Cube/Ottoman Two Pack in Charcoal Gray. Remove the cushion top to reveal a generous storage area for organizing clothes, blankets, linens, toys, remotes and more! Doubles as a plush footrest in the living room and is ideal for use as a stool in communal work spaces, dorm halls, or commercial environments like lounges. Folding construction means the cube sets up in seconds and uses little space in storage. Unit is lightweight (less than 8 lbs.) and folds away easily when out of use. Seville Classics products are backed by a 1-year limited warranty unless otherwise specified. The warranty protects against original defects in material or workmanship under normal home or office use for the duration of the warranty period. If you have any questions about this product by Seville Classics, contact us by completing and submitting the form below. If you are looking for a specif part number, please include it with your message.